It’s taken me a while to start running my fingers across the keyboard to compose the words to summarise Running Beyond. Even longer to take the photos. Last year when Ian told me I would be receiving a copy of his new book, I was ecstatic. As someone relatively new in ultra running media, I saw this as milestone in my career, from someone I respect and look up to. If you don’t know who Ian Corless is, you’ve seen his photos, read his words and had some interaction on social media. He is the voice of ultra running, the most famous camera wielding man at a race and someone who has shaped the way the sport is viewed on the world stage. The official media partner of the Sky Running World Series and official photographer at so many races…. Well you’ll need to read the book to appreciate the scale of his footprint. When you’re taking photos of a product created by an elite professional in the field, the setting needs to be special. So on an excursion to see the Great Edinburgh XC, the book was packed and our apartment at the foot of Edinburgh castle was a fitting location. For publishers categorizing a book can make the difference between a seller and a flop, making sure it reaches the intended audience with ease. If this was my job, I wouldn’t have a clue how to steer this left or right. A blend of stunning landscapes, intense action and raw emotion, combined with location history, first hand accounts from elites and course descriptions makes this more than something you can merely pigeon hole. What you set out on is an ultra of sorts, spanning the entire globe, moving between countries, region and terrain. From baron wilderness to alpine town, multi day to 23km, Running Beyond encapsulates the best of trail, ultra and sky running. If anything you need a check box as I found myself writing down a list of dream races, some within reach, some fantasy from the pictures painted. And yet, Running Beyond is as humble as it is a show case. Images of bloodied knees, exhaustion, relief and euphoria connect with the reader in a way no video could. Despite our hero’s being present looking superhuman, you see them in their darkest hours, when for a split second you feel like they could be your friend, one of us. It can’t be stressed enough how each element from history to stories, course info to images supports one another and provides a rounded and whole experience. If you were to remove any one part, it would detract from what has been created. Genuine is the best way to describe the course descriptions and you can image Ian trekking through the night to get the shot when the elite pack break through, all the while lugging a pack full of glass and kit, people wouldn’t carry on a low level overnight hike, let a lone a day in the mountains. 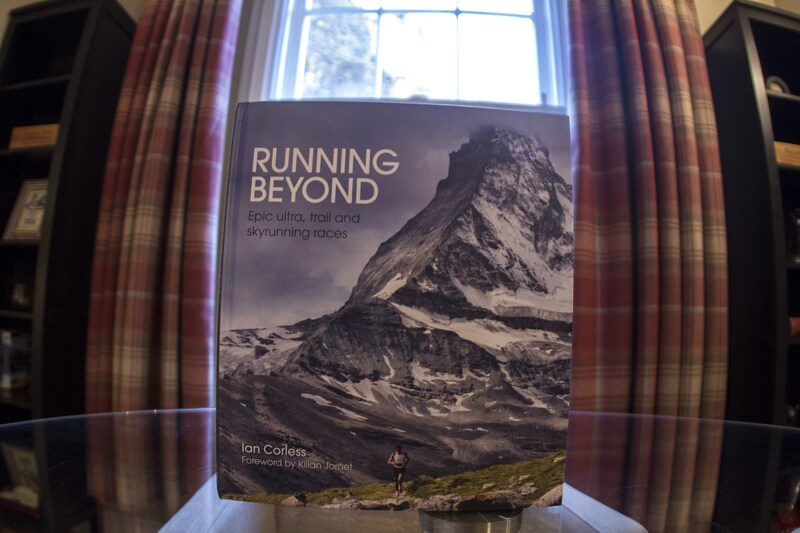 Running Beyond is more than a book, it’s a glimpse into the mountain running world. A 4 year labour of love, that has resulted in something truly unique and special. I found myself reading a few races at a time, allowing myself to be fully immersed by what I read and saw. Like many well crafted objects, I didn’t want to leave a single crease, testament to the quality of the construction and grade of paper. And that sums it up. Ian is a master at his craft. His passion can be seen across all 237 pages. For anyone with a passion for mountain running this is a must have. A book you will cherish, learn from, draw plans and reference for years to come.